Week 15 Early Games: Welcome to Goodburger! Cincinnati plays some games unexpectedly close …. against good teams and bad teams. But they’re pretty bad. Their wins this year have come against Browns (x2), Bills, Colts, Broncos. Only question this game is if they can keep it close, and we think they do so, for Marvin. Don't forget that Cam Newton is playing in this game. He’s secretly pissed every time someone not named Cameron gets any screen time. This Aaron Rodgers thing has been tough on him. He’s been wearing his angriest hat all around Uptown Charlotte this week. Bonus Pick: Cam is the only Panther who runs the ball from inside the two. Can you imagine how insufferable Philly fans will be if they beat up on the Giants this week? We’ve already played two Settle Down! cards on the Iggles this year, and we’ve got a third one just burning a hole in our pocket. If the Eagles finish up 13-3 (likely), its home field throughout the playoffs, and a second-round matchup between whoever wins that wild-card game (currently looking like Saints vs Falcons). Nobody in the NFC wants to play any of the South teams in the playoffs. It looks like the Eagles will have that game, unless Aaron Rodgers returns to the playoffs. If that storyline gets going, the media frenzy by then will be, shall we say, loud. In any event, we’re picking the Eagles to roll over the carcass of a once-proud franchise, and hoping they roll into the playoffs at 14-2 so we can fade them mercilessly. “if I hang a sheet in the middle of mom & dad’s basement, it’s like we have two rooms!” (Cousins). We don't like this game. But we think the Skins will make some things happen and win by a TD. No AP, and road game will put too much pressure on the Cardinals passing game. There have been 53 games since 2003 with a line of 16.5 or more. Favorites are 20-33 in those games. It sounds like a lot of games, but over 15 years it’s about 3.5 games per year. So this line says that this game is one of the 3.5 worst matchups of the year. We just don't see it. This line is 6 points too high. The Jets may be terrible, but they’re not, well, OK. They’re terrible. But they’ll cover. They got embarrassed by Denver last week and I’m sure they’re not very happy. So, yeah. The Saints line is 6 points too high. How many points too low is this line? 7? 10? Did Recently-Unfrozen Dr. Evil make the lines this week? We are going to watch only to see how Cleveland again blows both the victory and the cover. Onside kick returned for a TD by the other team? Totally plausible. You know who’s the Coach of the Year? Doug Marrone. He somehow convinced Blake Bortles that he’s not Blake Bortles by installing an offense that plays to his, um, strengths. He’s playing so soundly that his twitter feed doesn't even seem funny anymore. It just seems like facts. Unless it’s funny in some ironic hipster way. Then neither of us would be able to pick up on it, like when people can't hear sounds that drive dogs crazy. 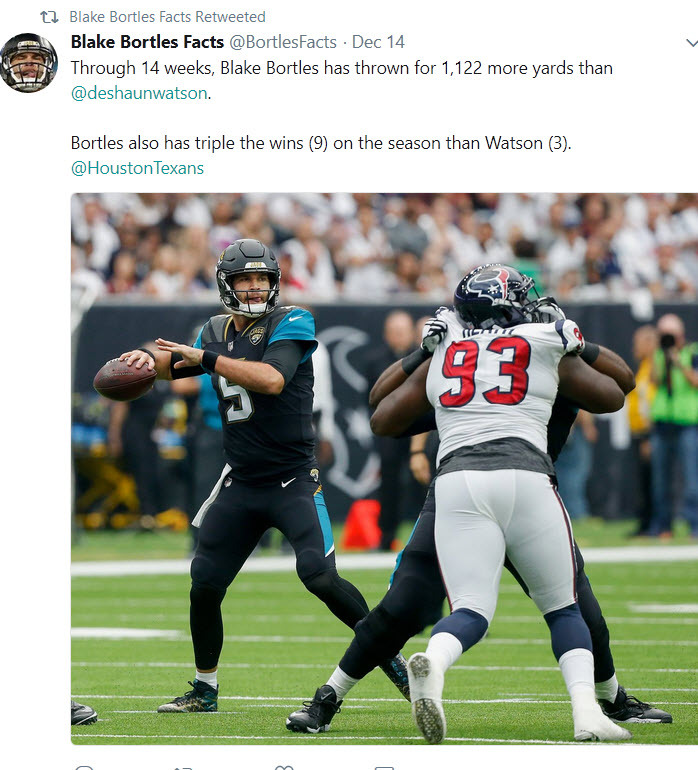 Anyhoo, Blake Bortles = no longer funny. He’s going to have to win it on the field. Without Fournette and Hurns. Much like Jacksonville itself, it’s not going to be pretty, but somehow they keep on keepin on. We think the Jags clinch a playoff berth today by less than 7. Bonus Pick: Take the Chargers against the Jags in round 1.